For the second time in a week, Hoboken saw itself a scene of outside the Mile Square boundary unity as Assemblywoman Annette Chaparro held a fundraiser upstairs at Mills Tavern last night. Last week, it was Phil Murphy's ascent glorified on Hoboken's waterfront as the municipal politicos showed in force getting behind the likely Democratic nominee for New Jersey Governor. The evening's event on behalf of Annette Chaparro was similar; one part business and one part love. The notables were of course all on hand led by NJ Assembly Speaker Vinnie Prieto but the room was a torrent of love and dare say, peace in our time or until Election Day when the BoE race will see vestiges of classical fault lines break out like it's 2009. The Assemblywoman who is not a political speaker by nature or temperament showed a classical personal touch extending her remarks more than once to offer gratitude to those in attendance and express her passion for Hoboken and performing as a representative of her NJ district. Those in attendance were crammed wall to wall with Mayor Dawn Zimmer adding remarks as City Council members Ravi Bhalla, Michael Defusco and Tiffanie Fisher were spotted among those heaving many a glass on the evening. City Clerk Jimmy Farina stood near the front and greeted a farm animal with his customary warmth as former Business Administrator Richard England sat amiably at the bar chatting on the ponies and the evening's mutual admiration society. There were more politicos of all shades, unions and sizes. Former Hoboken Chief of Staff Dan Bryan appeared more the conquering hero. He left public service working for Mayor Zimmer to the private sector but now is on the rocket ship called Phil Murphy. For a second, you might think he wasn't attending a political event but his wedding. He'd like to thank his dentist for all the smiles. Hoboken Police Chief Ken Ferrante stood by his lady although she didn't need much protection in this crowd. The Assemblywoman noted the recent tragic NJ Transit crash meant she gets up early in the wee hours when his phone rings off the hook too. All three of the Forward Together candidates for BoE made appearances: Jennifer Evans, Sheillah Dallara and Irene Sobolov who lingered beyond the customary time. Perhaps she thought it best to enjoy a slower evening as the candidates and their supporters have been knocking it out campaigning all over town. Unlike many political events, most didn't hit the exits after the remarks were concluded. The party only seemed to hit its height when one media maven noted the jams as Hotel California piped in over the sound system. You can check into the Mile Square City anytime you like but you can never leave. The Eagles lead guitar poured over the finest food you'll see served at a political event as the liquidity rolled gently down the hatch. The last of the good times before the coming November Election Day storm. Up the Republic! 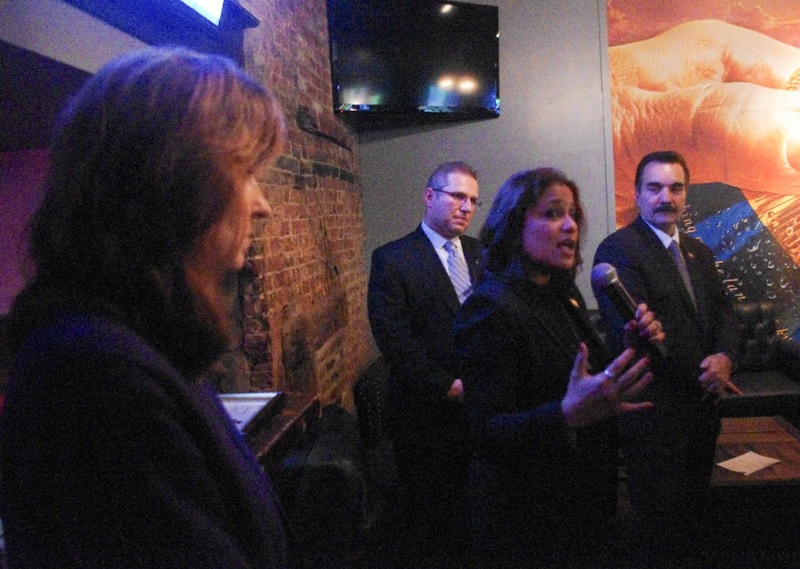 NJ Assembly Speaker Vincent Prieto, Hoboken Mayor Dawn Zimmer and Hoboken Police Chief Ken Ferrante look on.